Today on June 7th a day after the end of Swarm community AMA their associated token SWM trades 29.18% higher against the US dollar. SWM is happy to register an increase against the BTC and ETH as well. Respectively with 27.98% and 29.36%. With this marker value and circulating supply of 51,113,355 the market capitalization of Swarm (SWM) reached a value of $31,482,658. Apparently, after the organized Swarm community AMA that was issued for yesterday June 6th, new investors took the decision to buy some SWM and see whether it will bring them some returns on investments. The increased interest in the token eventually led to an increase of the market value of single SWM token. All the events contributed for 24h volume of $43,957. 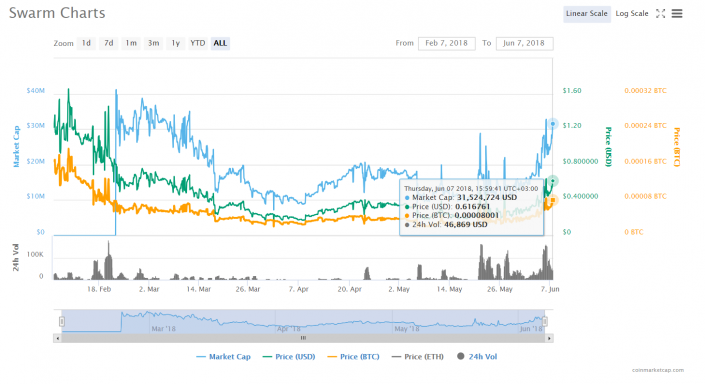 It’s true that the numbers of its uptrend today are notable but as seen in the chart generated by CoinMarketCap the level of SWM price almost stays still since February 2018. Swarm is a capital marketplace platform built on blockchain technology that tokenizes funds and other assets. The platform provides access and tradability to anyone who wants to make his crypto funds work for him. Users could buy tokens to participate in the development of different projects and see the opportunity growth. All trades are made through the use of blockchain technology which grants for their speed, transparency and security. "Our vision for Swarm is to have a wide variety of investment applications built on the same platform technology and liquidity pool." In order to use Swarm platform one should obtain the token launched by the company known as SWM. It is a standard ERC20 token based on Ethereum that is currently offered on IDEX and Bancor Network crypto exchanges. There is one issue that Swarm team needs to resolve and it is the poor speed optimization of their website. It takes quite a long time to load all the heavy elements placed on the homepage which could provoke many users to close the website especially when their interest is not strong. And as long as one of their core objectives is to build a strong community it is good idea to list the project on at least one of the well-known forums devoted to cryptocurrency market.